Manchester is the city of amazing libraries, and I made it my business to visit as many as possible. Chetham's Library- was founded in 1654 and is the oldest public library in the English-speaking world. It was the meeting place of Karl Marx and Friedrich Engels when Marx visited Manchester in the summer of 1845. When I visited on a rainy afternoon I was the only person there besides a few staff members. The rooms smelled of old books and wood, and the only sound was the pitter-patter of the rain, and my footsteps as I peeked in at each nook of the library. Manchester Central Library- was opened in the 1930s and loosely inspired by the Pantheon in Rome. There is a nice cafe and shop inside, and it's a library that's meant to be used and enjoyed. John Rylands Library- was opened to the public in 1900, and was founded by Enriqueta Augustina Rylands in memory of her husband, John Rylands. For me, this is the perfect library. The library took 10 years to build and every item was custom made. Rylands' widow was advanced in her thinking and equipped the library with cutting edge technology for the time, like electricity and climate control. She also chose an interesting location for the time; the poor factory district of Manchester. The library has always been a place open to the public, and meant for them to feel comfortable to use the library. It is still this way today, and there are many reading nooks available to any person that wants to use them. The library also houses various exhibitions. When I was there it was 'The Life of Objects.' This library is truly a magical place. Manchester Art Gallery- a wonderful art museum with intriguing visiting exhibitions. I was lucky enough to be there during the "True Faith," exhibition which explored the ongoing significance and legacy of New Order and Joy Division through the wealth of visual art their music has inspired. It was a moving exhibition, and I felt lucky to see it. It's free to enter! People's History Museum- a great museum about the working-class people of Manchester and the fight they fought to get rights for men, women and children. It tells the story of life in Manchester from the 1800s to modern times for everyday people that made a difference and made history. It shows the strength there is, and the change that can happen when people come together for a common cause. Marble Arch Inn- a traditional pub housed in a beautiful building with a beer garden out back. They serve traditional pub food, and have many local beers and beers from the brewery to choose from. We had a scotch egg to start and a chicken, ham and leek pie and a burger for the main course. Great food and great service. Happy Seasons- Chinatown in Manchester is the second largest in the UK and the third largest in all of Europe. We chose Happy Seasons as our place to try authentic Chinese food, and we loved it. Pieminister- a chain restaurant, but the kind that gets it right. The pies were absolutely amazing, and the dining experience is casual and fun. 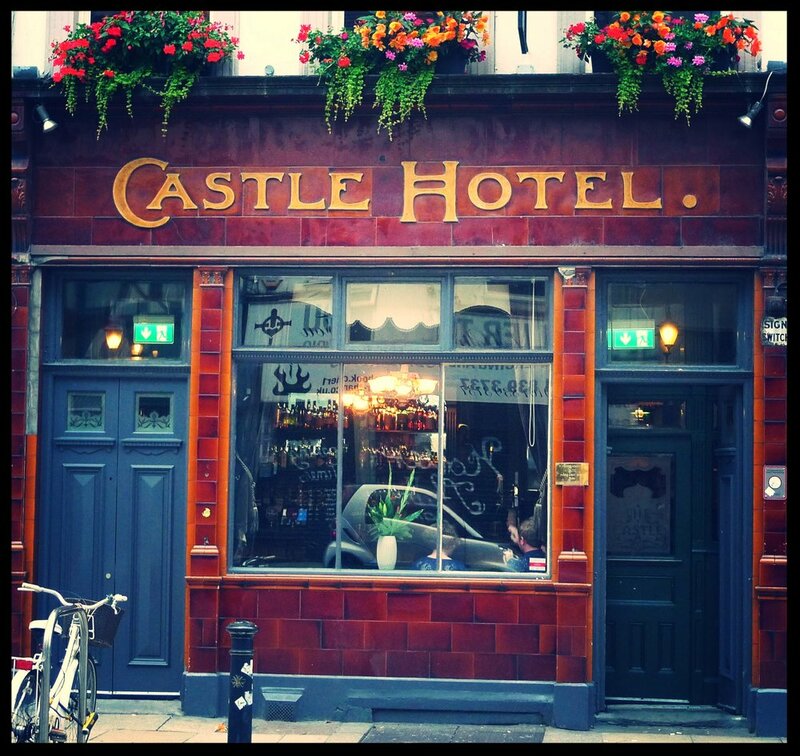 Castle Hotel- a perfect pub with a cozy atmosphere and good music. From the website: The 200 year long story of The Castle Hotel is woven not just into it’s bricks and mortar, its Victorian tiles or its mosaic floors. It’s a feeling that you can’t put your finger on. It’s in its people. In its memories. And in the layers of history built up over centuries of experience.The Castle Hotel started life in 1776, although records show that there has been a dwelling on the site since the 1400s. Over the course of a century the pub changed name several times, trading first as The Crown and Sceptre, then The Crown and Anchor and later The Clock Face. In the late nineteenth century the pub was acquired by Kay’s Atlas Brewery and started a new chapter as The Castle Hotel; which is probably when the current tiled façade and bar were added. In the early 1930s Frederic Robinson took over Kay’s Atlas Brewery and, consequently, The Castle Hotel.The pub’s now deeply cemented relationship with the city’s music scene probably began when it was a stopping off point for people on their way to Band on the Wall.In 1979, a now legendary John Peel interview with Ian Curtis took place here, weaving The Castle further into the fabric of Manchester’s musical heritage. Sadly, The Castle fell on hard times and closed it’s doors in 2008. This cherished public house was not to remain closed for long though, and in 2009 friends Jonny Booth and Rupert Hill took over The Castle Hotel and set about bringing the decrepit building back to life. Peveril of the Peak- another beautiful, traditional pub. The green glazed tiles covering the exterior are incredible. The bartender was kind and quick to serve us a local beer, which we drank outside watching the people coming and going to the pub. Fig and Sparrow- a fantastic latte in a calm and relaxing space that played good music and had cool items for purchase. 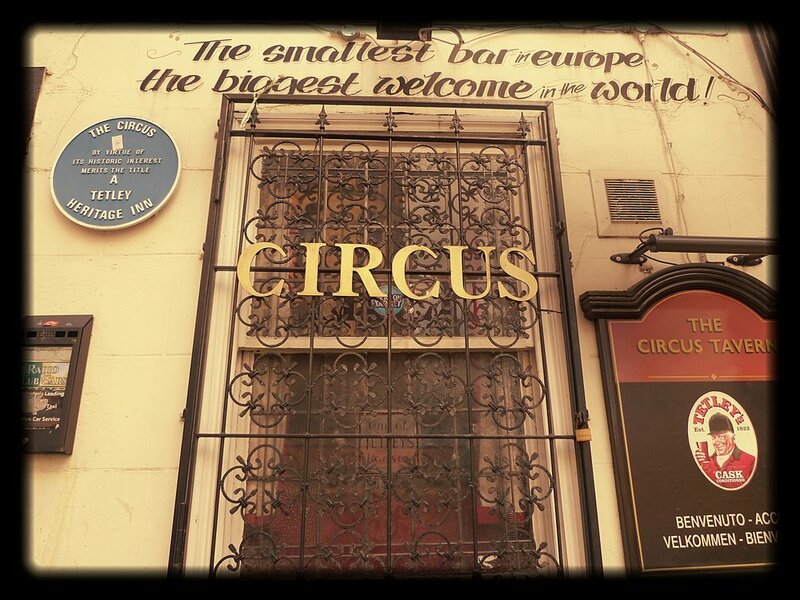 Circus Tavern- the smallest pub in the city and one of the smallest pubs in the country. It's a great place to meet locals (we did and they were upset about my lack of knowledge about football, ha, in a friendly way). It gets crowded quickly, as you would expect, but I certainly enjoyed having a pint with locals. The Knott- a great pub tucked beneath a railway arch good for people watching, because of its large windows, and if you're lucky you might see a gaggle of geese waddle by too. We asked the bartender how often that happens, and she said pretty often and that people don't really like them, because they can be mean, even biting sometimes. It was fun for me to look up from my writing and see that, and not at all the norm. Sculpture Hall Cafe- When is the last time you had a cafe in the center of a town hall? For me, this was a first, and I really enjoyed the experience of sipping on a latte while looking at murals, busts of influential people and gorgeous gothic columns and design. Sadly, it looks like the hall will be closed until 2024 for restoration. Fred Aldous- a delightful shop that started in 1886 with a few supplies to help people make things, and it now has a huge selection of art supplies, craft supplies, stationary, and haberdashery. It also has a photo booth with real film! I love this store! Boardman's Entry- a tiny passage honoring, John Dalton, a famous scientist that recorded the weather of Manchester every day for 50 years. He also proposed atomic theory. 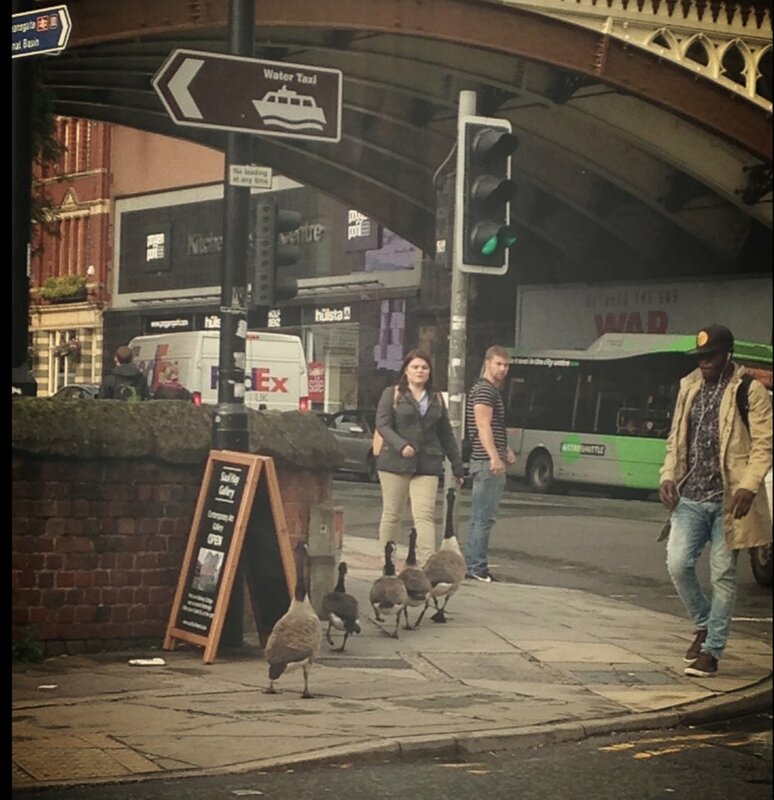 You have to listen to Joy Division and, New Order before walking the streets of Manchester. and Freddie and the Dreamers for fun!